Be sure to keep you BCM Jobs profile up to date. If you have an interest in any of these jobs, but this is the first time you've seen them advertised then information is missing in your BCM Jobs subscription. A blank subscription results in a monthly notification only, which might be appropriate for a passive job seeker - but not quite enough for an aggressive job seeker. Be sure to update your BCM Jobs subscription to stay better informed, according to your needs. This is the most efficient way to receive job notifications from BC Management. As soon as we post a new job opening to our website the job is also distributed via BCM Jobs based on search preferences by job type (contract, contract-to-hire, permanent), geography, compensation and travel. Click on the image above to view our July BCM Jobs Update for all our Contract and Permanent Job Activity. *Candidates must have authorization in place to work in the USA. **Our client is preferably seeking a junior level candidate who has previously worked on a technical team coupled with project management experience, running large calls, etc, and DR experience. Highly preferred skills would include network or Windows administrative expertise. • Plan, schedule, and coordinate execution of large-scale, global DR tests impacting all lines of business. • Manage schedules and resource allocation with Development Managers, IT and O&S team members, and business users/testers as required. • Coordination and management of IT resources across multiple time zones for DR / HA Testing events. • Initiate and manage DR related projects with project sponsors, stakeholders and team members using the Company Project Management framework standard project management process and knowledge areas. • Serve on the Engineering Committee representing the DR Team to review and provide input to all new application DR technical requirements and architecture design. • Produce standard DR deliverables including: DR Test Plans, DR Test Reports, and DR Plans. • Manage the DR Documentation Tool, CPO Tracker as the primary administrator. • Identification and communication of DR risks, and the development of risk mitigation strategies and escalation procedures. • Manage internal and external audit requests and responses. Address open audit items and Risks. • Manage the Disaster Recovery SharePoint portal with documentation updates, structure, access, etc. • Collect, trend and report key metrics for the DR / HA Programs. • Contribute to DR Policy and Standard Operating Procedure documentation. • Ensure and coordinate DR compliance with other IT frameworks and best practices such as the Control Objectives for Information and Related Technology (CobIT) and the Information Technology Infrastructure Library (ITIL) respectively. • 5+ years strong experience in IT program and/or project management. • Disaster Recovery experience a must. • Business Continuity experience a plus. • CBCP certification a plus. • Proficiency with Microsoft SharePoint; SharePoint site administration a plus. • Experience using a documentation management software; Specifically, CPO Tracker a plus. • Demonstrated knowledge and skills in the following competencies: leadership, project management, information technology, creativity, business analysis, problem solving, service level management, and service management. • Demonstrated strong proficiency in interpersonal and communication skills including oral and written English. • Availability and willingness to travel occasionally to other Company locations for business. • BS Degree in Computer Sciences, Information Systems or equivalency. Senior Business Analyst Enterprise Risk Management role is responsible for working as part of a project team to develop and implement the RSA Archer Enterprise Risk System Modules. Specifically, the responsibilities include reviewing, modifying and recommending business/technical requirements applied to the risk management system and guiding the risk management team to acquire a working knowledge for rollout to their business partners. This role works closely with risk, operational and technical teams, to scope, document, guide, test, record and track issues and implement any needed changes to the determined solution. The selected candidate will gain a thorough understanding of existing requirements and must thoroughly understand the organizations' business technology and the information systems framework and the issues and challenges facing the organization to achieve successful implementation. • Develop project plans including, requirements, risks, schedule, testing, etc. • Available to conduct meetings via WebEx and Video relationships. To be considered for this position, please submit updated resume and short bio to http://www.bcmanagement.com/search-jobs.html and reference Job Order # 2744. Data Finding - How Often do Organizations Exercise Plans for Mission Critical Third-Parties? How often do organizations exercise business continuity/ resiliency programs for their mission critical third-parties...? This is the first year we've inquired on this data point in our BCM Program Management Trending Study and we thought it would be an interesting data finding to highlight as we prepare to release our 1st Annual BCM Critical Third-Party Assessment Study, scheduled to be launched later this week. Stay tuned! The data graph above is for all study respondents who participated in BC Management's 9th Annual BCM Program Management Trending Study. We acknowledge that this data point will change when customized with any of the following criteria is applied: maturity of the program, industry and size of organization. This certified CBCP candidate has an extensive background in leadership, information technology and assurance, process improvement, and mentoring. The candidate uses strategic planning, project management, communication, and thorough documentation to ensure success and quality in projects. A no-nonsense approach maintains focus on the organization’s deliverables while managing customer relationships and expectations. Integrity and quality are hallmarks – has held a Top Secret clearance and diverse industry background means this candidate is comfortable in any organization working with at any level. Experience includes public sector, the private sector, and the military and telework, permanent office, and floating office environments. Excellent understanding of compliance comes from performing audits and being. Having served in full time and contract positions in both the public and private sector, this candidate understands risk containment, return on investment, the importance of appropriate scope definition, and communications. Monday, July 21st at 11pm EST. Just DAYS left to participate in BC Management's 9th Annual BCM Program Management Study. Strategic planning is assessed in this study among several other trending topics. The initial data findings from our study indicate that 80.9% of the respondents do strategic planning for their BCM program while 19.1% do not. View the data chart below detailing how far out companies plan strategically for their BCM program. Have You Participated in our World-Renowned Study? Get this Data Point and More! is live thru July 21, 2014 - DAYS LEFT!!! Remember to share with friendsOnly study participants will receive our complimentary BCM Program Trending report, which includes an assessment from our International Benchmarking Advisory Board. Study focuses on Business Continuity Planning Management initiatives, such as program integration, executive support, reporting structures, assessments, exercises, auditing, current state of program, budgeting, staffing, standards and maturity of the program. - Study accommodates planners to global manager. - Study questions and assessment of data is completed by BC Management's International Benchmarking Advisory Board. - The study is available in English, Spanish, French, Chinese and Japanese. - Completely confidential - Your individual contact and company information is never shared outside of BC Management. 25 years at both executive and program-level corporate and commercial operations resolving organizational and operational issues to ensure long-term business and operational survival. In-depth expertise engaged with commercial (Fortune 500), private, federal, military, intelligence, and inter- and multi-national clientele worldwide (East & Western Europe, Africa, Pacific Rim, & South America) in critical enterprise and infrastructure protection – for facilities, information, people, activities, and operations – developing and leading programs to mitigate critical security and continuity conflicts across high-performance organizations at both the national-level leadership and C-Suite Executive levels. Banking; Transportation (Air, Rail, Port); Utilities (Telecom and Power); Nuclear, Chem, Bio, and Energy facilities risk management ; Hospitalities; Media; Legal; Border; IT systems, security and human resource assets et al. Certification: MBCP or MBCI preferred. Our client is in need of a Senior Consultant to help run BC/DR testing for a large scale project. The successful candidate will have experience running 40+ BC/DR test's along with a strong background in both business continuity & disaster recovery within a financial institution. Industry certification and 8+ years experience is required. Candidates with a professional services/consulting background highly preferred. Must be able to work under pressure and have excellent communication and presentation skills. Who is Totally Engaged and Sponsoring the Continuity/ Resiliency Program? Just ONE week left to participate in BC Management's 9th Annual BCM Program Management Study. Sponsorship is assessed in this study among several other trending topics. 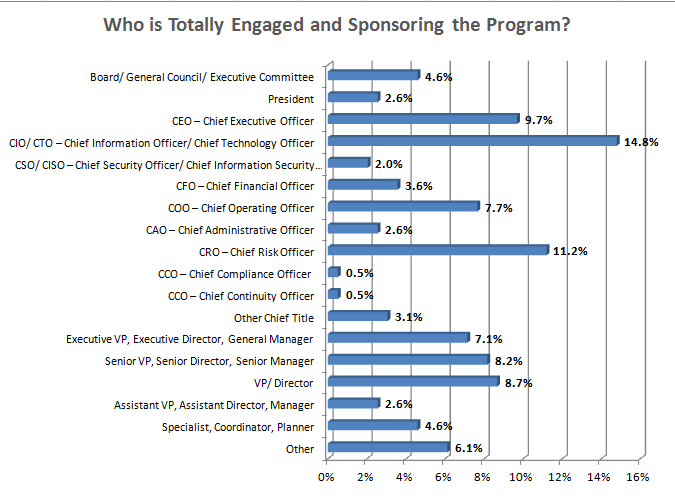 The initial data findings from our study indicate that 62.7% of the respondents noted a Chief Officer level or above as totally engaged and sponsoring the continuity/ resiliency program. Within this category the Chief Information Officer/ Chief Technology Officer - CIO/CTO (14.8%) and Chief Risk Officer - CRO (11.2%) received the greatest response. In comparison, the 2009 study results showed that 18.9% of the study respondents noted CIO/CTO while only 3.4% noted CRO. Furthermore, the 2009 study results also showed that 58.7% of the study respondents noted a Chief Officer level or above as totally engaged and sponsoring the continuity/ resiliency program. is live thru July 18, 2014 - LESS THAN ONE WEEK LEFT!!! Only study participants will receive our complimentary BCM Program Trending report, which includes an assessment from our International Benchmarking Advisory Board. Our client is seeking a contract BCP Contract Consultant to work through several phases of a Business Impact Assessment. The chosen candidate must have previous experience conducting a BIA and must be able to commit on a full-time basis to a 3-4 month engagement on-site in Westminster, MA. To be considered for this position, please submit updated resume and short bio to http://www.bcmanagement.com/search-jobs.html and reference Job Order # 2741. This candidate has significant experience leading highly successful Business Continuity programs in the private and non-profit sectors, in medium and large organizations, specializing in the financial industry. Located in the Chicagoland area but willing to consider select relocation opportunities, this results-driven MBA has demonstrated proficiency in business resilience, disaster recovery, risk mitigation, vendor management, and telecommunications, with strong communication and team building skills. Organizational strength includes management of medium and large teams, and effective problem solving at the enterprise level. As an individual contributor or at the Director level, this candidate will help transform your program to world class status. A “people person”, he is an engaging leader with a good sense of humor and a business acumen that suits any corporate culture. The candidate understands the need to balance prudent risk mitigation strategy while driving corporate innovation and profitability. Above all, this candidate has a dynamic work ethic, is committed to team-based success, and strongly believes in “checking your ego at the door”. Under the guidance of the Director/Senior Business Resiliency Manager, the Business Resiliency Manager interfaces with all functions and areas of COMPANY and its subsidiaries to support effective enterprise business and technology interruption preparation, response and recovery. This position is responsible for implementing and maintaining the business resiliency methodology and frameworks. In addition, this position leads the testing and monitoring activities which validate that COMPANY’S business functions are adequately prepared to respond to an incident. efficiency, risk mitigation, and issue resolution. and addressed, and program implementation and operation are successful. and business area resiliency plans. 1. Five plus (5+) years relevant work experience with general industry experience in risk management. 4. Extensive experience in organizing resources, establishing priorities and leading projects. 5. Client service orientation with exceptional customer facing skills across a diverse range of stakeholders. party partners, and team members. solutions, and business process re-engineering. 8. Demonstrated integrity within a professional environment. 9. Flexibility to travel up to 10%. 10. Requires 24/7/365 availability to respond to any corporate emergency. To apply to this position please visit http://www.bcmanagement.com/search-jobs.html and enter the job number 2740.